Infection with HIV (human immunodeficiency virus) compromises the body’s immune system thereby making it prone to various infections and rare cancers. It is the immune system that normally protects a person from invading microorganisms and prevents the excessive growth of abnormal cells as is seen in cancer. However, with HIV infection the immune ability is impaired and diseases that are otherwise uncommon can arise more frequently in these patients. Infections of the mouth, rare mucosal disorders and cancers of the oral cavity are some of the most debilittating conditions associated with HIV infections. It affects the patient’s ability to eat and drink, can make talking difficult or painful and lesions that extend around the mouth may be unsightly thereby causing social distress. On the other hand, these mouth problems associated with HIV often compel the patient to seek medical attention as early as possible when compared to infections and cancers affecting other organs or systems. It is important to note that these mouth problems are not specific to people living with HIV and AIDS patients. It can occur in any person. Some of these mouth problems are more often associated with a weakened immune system as is the case with HIV infection. These mouth problems can therefore be divided according to lesions more frequently or less frequently associated with HIV infection. Although the latter may affect a wide population group where HIV is not a problem, it nevertheless has to be noted as it may be more treatment-resistant or severe in patients with HIV infection. Fungal infections such as oral candidiasis (oral thrush) is the most commonly associated disease with HIV infection. The disease is noted by the formation of white to whitish-yellow plaque-like membranes over the oral mucosa, which can be scraped off. The lesions leave behind an swollen red eroded area below the white membrane. These fungal infections may also be associated with angular cheilitis where there is inflammation and sometimes sores at the corners of the mouth. It is a sign of proliferation of microorganisms including yeasts like Candida albicans that causes oral thrush. The symptoms associated with oral thrush include burning sensation in the mouth, altered taste sensation and discomfort on consuming spicy foods. The condition can be treated with use of topical or systemic antifungal drugs. Oral hairy leukoplakia (OHL) is another very commonly seen disorder associated with human immunodeficiency virus infection. 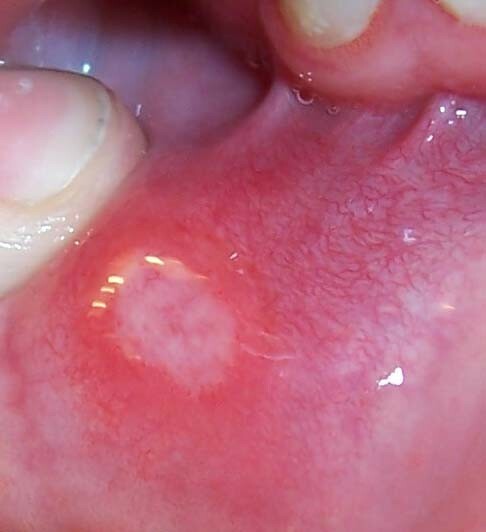 Non–movable, corrugated or hairy type white lesions develop on the inner lining of the mouth (oral mucosa), primarily on the lateral margins of the tongue. The lesions can be on one side (unilateral) or on both sides (bilateral) and the surface of the lesion is irregular with prominent projections, resembling a hair-like structure. It is associated with an Epstein-Barr virus (EBV) infection and is not pre-cancerous. While at times it may be confused with oral thrust, it is important to note that hairy leukoplakia lesions cannot be scraped off as is the case with yeast infections. The lesions are generally asymptomatic and do not require any treatment. The bacterial lesions associated with human immunodeficiency virus infection primarily involve necrotizing gingival and periodontal disease. In few cases a linear red line formation on the gingival margins can be one of the early signs of HIV infection and it is known as linear gingival erythema. The other infections commonly associated with human immunodeficiency virus include necrotizing ulcerative periodontitis and necrotizing ulcerative gingivitis. With HIV, these periodontal infections occur even with good dental hygiene and in the absences of dental plaque and calculus. Bleeding from gums, fetid odor from oral cavity and swollen gums may be the early signs. As the infection progresses ulcers are formed over the surface of gums covered with slough, leading to severe pain. Fever, chills and body ache may be accompanied symptoms. The disease leads to rapid loss of periodontal structures, including loss of the bone forming tooth socket. Kaposi’s sarcoma may occur in patient infected with human immunodeficiency virus. It can occur intra-orally (with the mouth) either alone or in association with skin lesions. It is a sign of late stages of HIV infection and could be the early sign of development of acquired immunodeficiency syndrome (AIDS). It appears as a red, bluish-purple colored lesion affecting any part of the oral mucosa, most commonly affecting hard palate. The lesion may be flat or elevated and can occur in both solitary and multiple forms. Occasionally yellowish mucous membrane surrounds the lesion. The oral lesion of Kaposi’s sarcoma may become enlarged and undergo ulceration or become secondarily infected. The treatment of Kaposi’s sarcoma depends on the number of lesions, extent of the lesions and the part of oral mucosa involved. Oral hygiene maintenance is an important part of the treatment to avoid secondary infections. Localized chemotherapy and surgical excisions are commonly considered treatment option in the treatment of Kaposi’s sarcoma. Non Hodgkin’s lymphoma is a frequent malignancy associated with human immunodeficiency virus infection .The lymphomas can occur anywhere in the oral cavity affecting soft tissues or bones or both. The lesions are generally present as firm, painless swelling that may be ulcerated. The treatment oral lesion depends on the overall progression of the disease within the body. Herpes virus infections including herpes simplex and herpes zoster are also few of the viral disease associated with human immunodeficiency virus. The herpes simplex virus (HSV) primarily affects the vermilion border of the lip. The lesion is represented by formation of small vesicles in clusters that rupture and form crusts. It is commonly known as a cold sore and should not be confused with a canker sore.. Within the mouth the lesion can affect hard palate, gingiva and tongue. The herpes zoster infection generally causes skin lesions, characterized by multiple vesicle formation on skin, lips and oral mucosa. The infections can be treated with anti-viral drugs such as acyclovir. Recurrent apthous ulcers are also seen in association with human immunodeficiency virus infection. It is also known as a canker sore and must be differentiated from cold sores which are due to herpes simplex virus infections. Mouth ulcers are not uncommon in the general population even in people who are not immunocompromised. The exact cause is unknown but recurrent mouth ulcers is commonly seen in HIV infection. These ulcers can be treated with topical application of steroids. Purple colored petechiae and hematoma formation inside the oral cavity or skin lesions are commonly seen in thrombocytopenia purpura associated with HIV infection. Bleeding inside the mouth is also fairly common. The condition is treated depending on the severity of decline in the platelet count.